Mosammat is the seventh participating teacher in our Teacher Tuesday campaign. Bangladesh is hit by flooding every monsoon season making access to school hard for those living in the affected areas. Mosammat describes what it is like teaching on a solar-powered floating school. 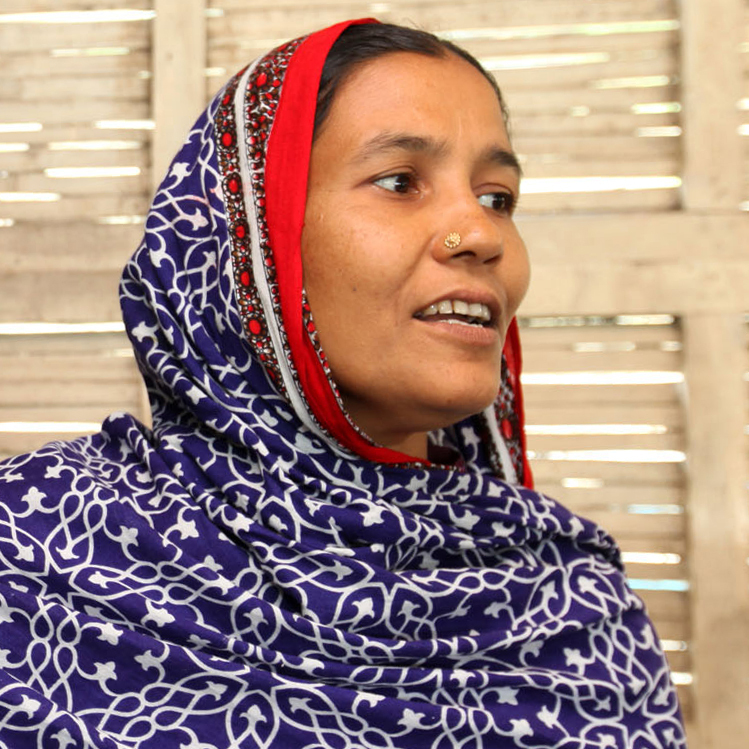 Mosammat Reba Khatun is 40 years old and lives in a small riverside village in Bangladesh. 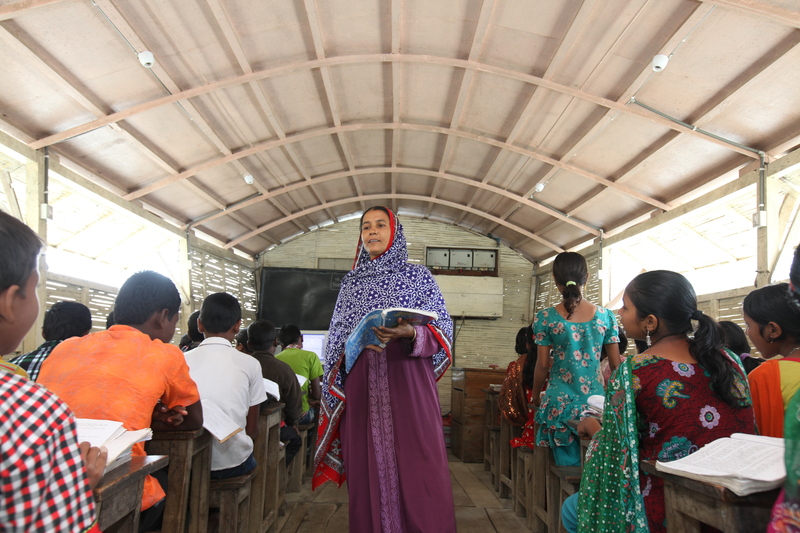 For the past ten years she has been teaching Bengali, Maths and English on Shidhulai Swanirvar Sangstha’s floating school on the Gumani river in the Pabna district in northwest Bangladesh. In total, the school teaches 90 students between six and nine years old. Almost two-thirds of the pupils are girls. The floating school works in the remote river basin where access to education is hard, particularly during the monsoon season. From late June to October one third of the country goes underwater, making access to basic services very difficult. “It is the main reason for school drop outs in rural Bangladesh” Mosammat said. 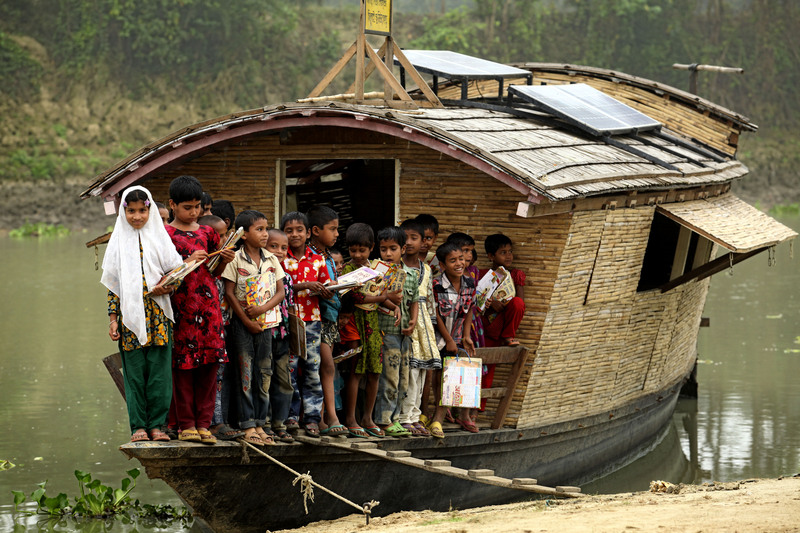 Were it not for innovative inventions such as this floating school, many of these children would find accessing education impossible. The school collects children from their homes, teaches them on board and returns them at the end of the session. Mosammat describes the boat’s architect’s philosophy as ”if the children couldn’t come to school, then the school should come to them”. “The teaching can be very challenging,” she continues, “as we are working with children from landless, extremely poor families vulnerable to natural disasters. Their parents mostly work as day laborers and have irregular family income. The children under age 5 are malnourished and infant mortality rate is high. Girls are not allowed to move around freely. We meet with the parents monthly to encourage them to send their children to school regularly”. As a result, she tells us, “the rate of early marriage is reduced”. In a further innovative step, the boat is solar powered, allowing the school to have internet linked computers, making learning more interactive. “I think technology makes learning easier for children from disadvantaged backgrounds” Mosammat said. Being solar powered also enables the boat to have solar lanterns, allowing for children to have light by which they can do their homework in the evening. The latest EFA Global Monitoring Report 2013/4, Teaching and Learning: Achieving quality for all confirms that innovation in the use of technology can improve learning by enriching teachers’ curriculum delivery and encouraging flexibility in pupil learning. This depends on teachers having the right training to be able to use new innovations in technology effectively in their work, which is why Mosammat takes part in refresher training every month and ensures that the teachers on the boat share the feedback they receive from the pupils’ parents on a regular basis. This entry was posted in Asia, Disaster preparedness, Poverty, Teachers, technology, Training. Bookmark the permalink. Yes, the technology would not be anywhere as effective without a good and committed teacher. An inspiring story to read. People never give up hope in bettering themselves and the lives of those they live around. I love reading stories of committed teaching combined with innovative technology. Your school is a living example of what can happen when inquiring minds work together. I love that even in the most remote location these children are connected globally. People of Bangladesh really beating the disasters for education. We are proud on the teacher and all the students who are doing in the study in these circumstances. Bangladesh is a poor but this country is education in first………………..so very happy in this country………………. Great post! Been reading a lot about different innovation for education. Thanks for the info here! Glad to read about this innovative solutions to improve and promote education in Bangladesh. This strategies are cheap, environmentally friendly and reach to root level people are in disadvantaged fro current system. Nice. like it. carry on good work. Reblogged this on BRIEF NEWS21.